Australia’s recent decision to buy 12 new-build EA-18G Growler electronic warfare variants of the F/A-18F has given manufacturer Boeing hope that it can sustain its Super Hornet production line in St. Louis, Mo., to 2016 and beyond. With the new order from the Royal Australian Air Force (RAAF) and the U.S. Navy’s request for 21 more Growlers in the President’s Fiscal Year 2014 budget, “we have a production line that is solid and will deliver jets through the end of 2016,” said Mike Gibbons, Boeing vice president for F/A-18 and EA-18 programs. New international orders and additional U.S. buys could sustain the line beyond 2020, he told reporters in St. Louis earlier this month. 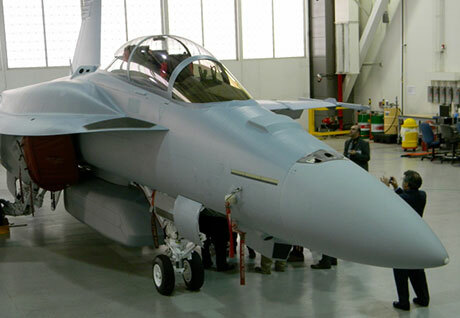 The F/A-18E/F is competing for Brazil’s long-running F-X2 requirement for 36 fighters. Boeing has also held discussions with several countries in the Middle East and plans to respond formally to Denmark’s pending fighter competition, Gibbons said. It has answered a capabilities questionnaire from Canada, which like Denmark is evaluating alternatives to a planned buy of Lockheed Martin F-35s. Boeing thinks that Brazil will be the first of these countries to decide. Australia originally planned to convert half of its 24 existing F/A-18F Super Hornets to the Growler configuration. In a joint announcement on May 3, Prime Minister Julia Gillard and defense minister Stephen Smith said the government has decided instead to retain the Super Hornets and buy 12 new EA-18Gs. While the government remains committed to replacing Super Hornets with up to 72 F-35s eventually, it will defer a decision on replacing F-18s with additional F-35s until closer to their planned withdrawal date in 2030. With Australian F-35s due to enter service around 2020, the RAAF will be operating a mixed fighter fleet. Boeing hopes to interest the U.S. Navy in a stealthy “Advanced Super Hornet” package of upgrades, including conformal fuel tanks (CFTs), centerline enclosed weapons pod and a Lockheed Martin infrared search-and-track (IRST) sensor system that can be retrofitted as needed into the fleet. Boeing and the Navy plan to test fly an F/A-18F modified with CFTs and weapons bay late this summer at Patuxent River Naval Air Station, Maryland. Gibbons said the Navy has not yet committed to the upgrade, but will likely decide during its program objective memorandum (POM) process whether to proceed, with 2018 as a possible date of availability. Meanwhile, GE Aviation is developing an F414-GE-400 “enhanced engine” for the Super Hornet that will have lower specific fuel consumption, increased tolerance to foreign object damage and provide better acceleration. The Navy is expected to select a winning contractor later this year for the Next Generation Jammer pod that will be fitted to EA-18Gs, with initial operational capability planned in 2020.